Do you remember me saying a couple of weeks ago that I hardly ever do cakes? Well, I’ve made another. A last minute request for my youngest cousin who was 14 last week. The only theme suggested was football which seemed perfect for him. The dome cake is great for a cake that is due to travel, rather than a complete round cake. This cake was made using a 9″ mixture so should serve approx 25 people. It is not a small cake. One thing I did forget was how difficult it is to get the hexagons neat on a football cake. I used a 2.5 inch hexagon that I cut out of paper and used as a template. Tip: Start at the top of the cake and work your way down. The bottom can be disguised with a scarf or some grass if you prefer. I used a large Pyrex bowl to bake the cake in. First use vegetable fat or butter to grease the bowl. Then sprinkle plain flour into the bowl, making sure all the surface is covered. I’m a little bit cautious and always put a small circle of baking parchment at the bottom of the bowl to make sure the cake doesn’t get stuck. The scarf is a nightmare! No matter how hard I try it is virtually impossible to stop the red bleeding into the white. The key is to use only the tiniest bit of glue to attach the red. I roll over with a huge screw to make the markings. If you have been watching my instagram stories, you would have seen me making the grass effect on the board with some tinned foil. Jenny kept last week’s Bake of the Week open extra long for me as stupidly, I forgot that my cousin wouldn’t see his cake until Saturday. I never blog about a cake until I know it has been at least seen, if not eaten! Thanks as usual to everyone who entered our linky. Our Facebook group for #BakeoftheWeek has had a great week too. There’s loads of chatter on there, sharing of ideas, asking for help & tips – Perfect baking hygge! 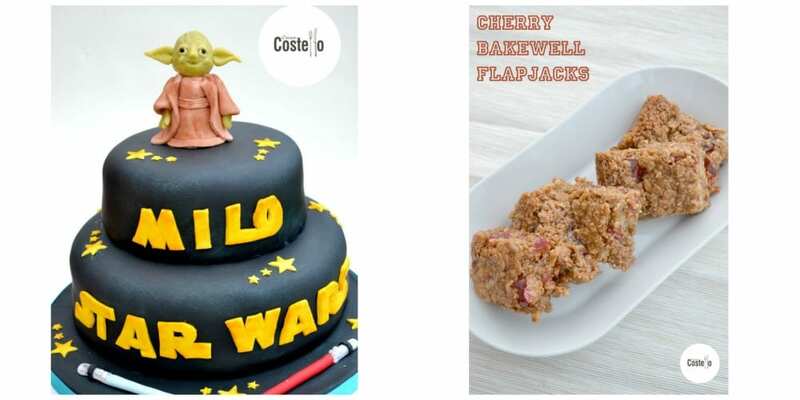 Last week we had our first ever influx of peanut butter & what tasty recipes they looked too. 1. Jenny shared with us this Peanut Butter Egg Chocolate Cake Extravaganza – And an extravaganza is definitely was. Amazing! 2. We had a very tempting Peanut Butter & Chocolate Banana Bread from Curly’s Cooking. 3. I’m a sucker for fudge and think the sound of the saltiness of the peanut butter in A Baking Explorer’s Reese’s Peanut Butter Cup Fudge sounds wonderful. My featured #BakeoftheWeek is from Jo’s Kitchen Larder with one of my favourite things to eat EVER! 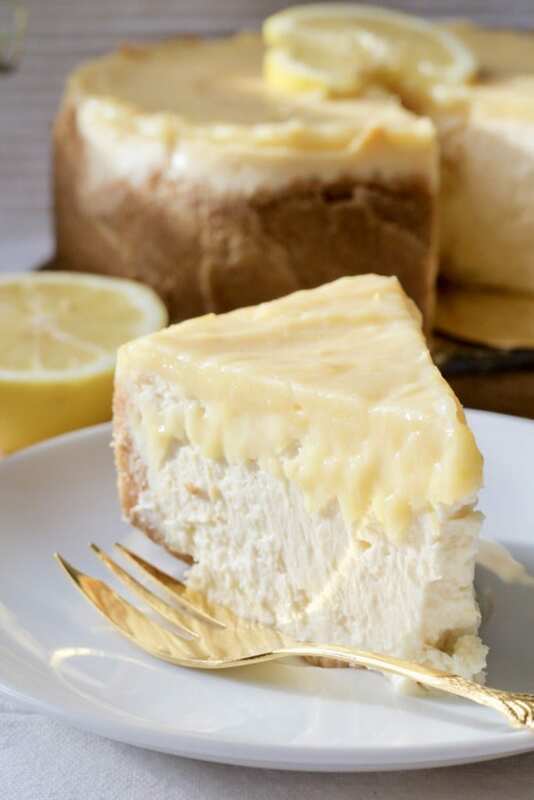 I adore a Baked Cheesecake & am desperate to try this Lemon Curd Baked Cheesecake. We are now open for new entries for Bake of the Week. Even if you have never joined in before, just have a go! We would love to see new members join us. We share all entries (Twitter, G+, Pinterest, Yummly & SU) and comment as well as linking in the following week’s roundup. what a fantastic football cake Helen. So neat. I bet your cousin was thrilled with his cake. Aaw I think he was pleased – His little face was full of smiles anyway! Wow your football cake looks fabulous! Thanks very much Kat – I love a bold theme to work with. Oh Helen, you’re so clever. I’ve been thinking about getting one of those fancy dome baking tins, but looking at this I don’t need to! No save your money – Go to good old Wilkos and get a Pyrex bowl instead! Wow Helen, love, love, love the cake! It’s funny cause it looks fabulously impressive yet relatively simple to make but then when you really look into intricate detail with all the hexagon bits, scarf etc. not so simple after all! lol You are such a clever lady! Thanks Jo – Your comment made me smile. Every time I fool myself into thinking I’ll do a simple cake, they turn out deceptively complicated. Loved your cheesecake! Oh, the lemon curd cheesecake looks stunning! 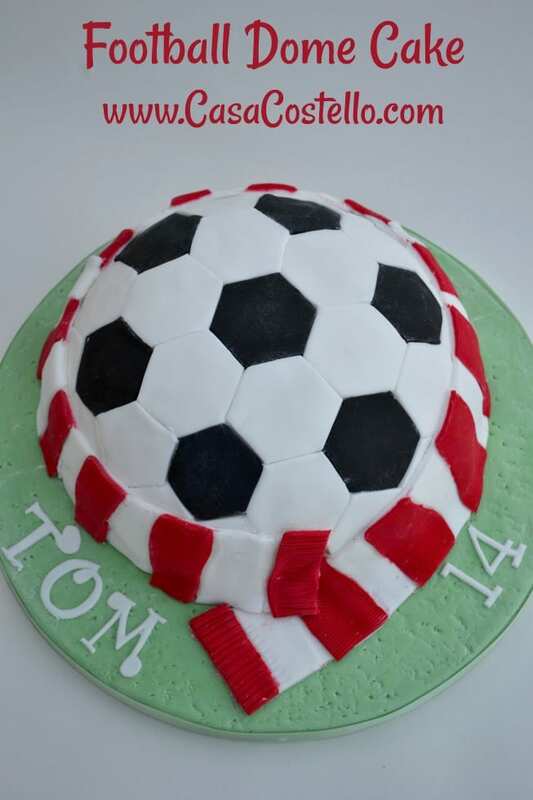 Loving the football cake too – so creative! Doesn’t the cheesecake sounds incredible? I’ve been dreaming about it all week! Thanks Kara – I think I would have to change the scarf colour for some of the blues around here though! HA! Well, thank you very much! That’s how we all start – by having a try! Good luck. How cool is that – it amazes me some of the things people can make cakes to look like. So talented. Oh there are some seriously talented people around the world that make cakes not look like cakes! Fantastic football cake and bakes! Would love to join in with the bake of the week one day. I made Albanian honey & nut cakes yesterday! Oh wow, an Albanian honey and nut cake sounds amazing. Please join in whenever you are ready! The cake is so beautiful!! Cant believe you baked it in a pyrex bowl, how creative is that? I am sure your cousin would have loved it! I hear reports that he was rather pleased. Pyrex bowls are the way forward! I absolutely love this cake. The scarf looks great as well. I once helped my friend make a similar one for her brother, but I don’t think our scarf looked as good. Oh can definitely see the faults in this but I had fun having a go! I love how you’ve made the grass using tin foil. What a clever idea. I use tinned foil for so many cake decorating short cuts! Oh wow that’s fab! My son would have loved this when he was a little younger, it’s not quite as cool now he is 13 apparently! Great work! Nothing is cool when you are 13! Even worse at 15! Thanks. You are so talented , the cake looks superb and I am sure your son will have loved it. Such a stupendous effort. Your football cake is fantastic, well done you. The marks on the scarf look really effective. All very lovely considering it was a last minute make, I imagine your cousin was thrilled. Ah what a brilliant football cake. I love seeing the amazing things people can make with cakes. Baking is not my forte so it fascinates me. Your football cake looks great! I bought a round baking tin years ago and attempted several cakes and none of them came out right so I gave up and haven’t tried again since! This makes me like your cake even more! That football cake is amazing! I would love to make something like that for my boyfriend’s football team! You’re so talented, keep baking!